Get your tissues out. It’s time for a epic love story. 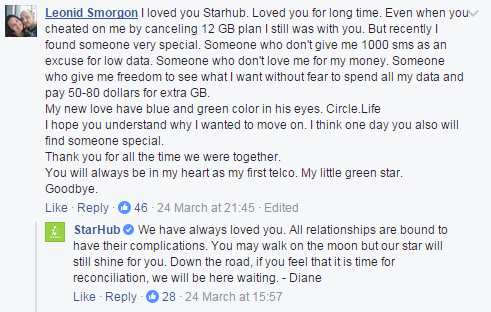 Most recently, a customer decided to publicly break up with StarHub through a social media post. The former StarHub customer, in a heartbreaking (but funny) letter, said he will be cancelling his current line as he is choosing to take up another plan with newly inducted online telco Circles.Life. 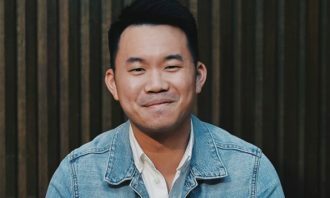 The matter was brought to Circles.Life attention on its own Facebook page by another user Lewis Loh, who referred to them as the “third party” in this break up. 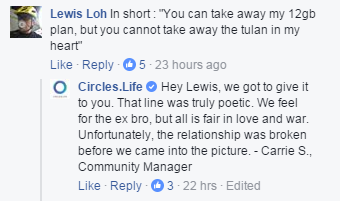 Not missing out on the opportunity to be part of the drama, Circles.Life decided to defend itself in this “broken relationship”. At the time of writing, StarHub had not yet responded to the Circles.Life post and did not say if it will be responding. We are glad that the breakup had been an amicable one. 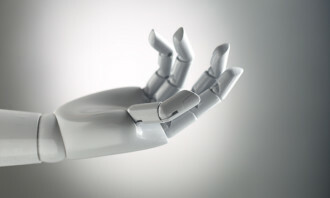 It is certainly our wish to reconcile with this customer should he have a change of heart. “We will continue to work on improving our offerings and customer service to delight our customers,” Strother said. Break-ups a part of Circles.Life’s personality? Meanwhile a spokesperson from Circles.Life simply said its response to the consumer was written up in “good fun” and declined to comment further. 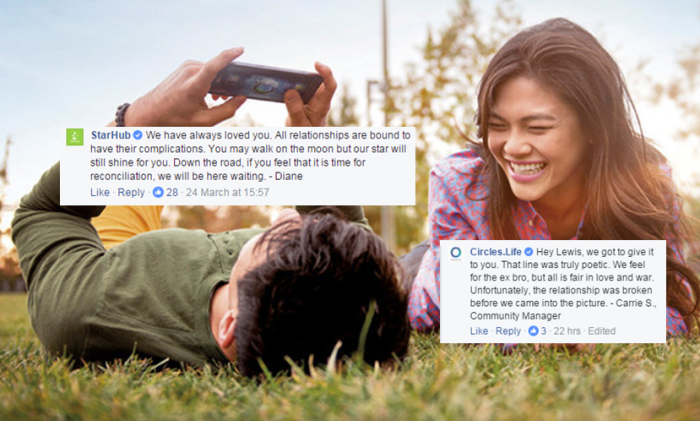 The break up concept is not one which is new to Circles.Life, which launched a campaign spot last year featuring customers of Circles.Life who are classified as “Super Users” of the telco. 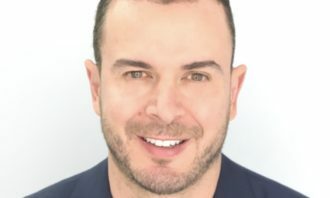 The spot showed four individuals talking about what seems like a personal break up experience, only to reveal later on that they were referring to their past mobile data contracts, which are inferred to be from competitor telcos. Earlier this year, the online telco also pulled a marketing stunt which saw the vandalising of “competitor” out of home (OOH) assets. The competitor in question was SGMobile, a fake company claiming to be Singapore’s “fourth telco”. This was to highlight the frustration of data-savvy Singaporeans with the limited amount of data available in mobile offerings today. 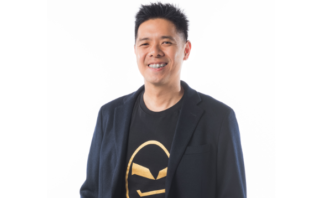 It also poked fun of the existing data packages using SGMobile, and build up to its own campaign which promotes “20 GB for SG$20 Data Plus” option. iflix has closed a new round of funding in excess of US$90 million to support its further international expansion. The new round w..
Unilever’s Dove brand has also gained accreditation by PETA, which will see PETA's cruelty-free logo appearing on Dove packaging f.. If you are in the Philippines looking for a place to house 55,000 people for your next on-ground activation or conference, you are..